I am a bit of a soup freak at the moment. They are quick, easy, cheap and good for you. Lunch doesn’t have to mean a sandwich especially if you are a bit of a delicate flower like The Washer Up. Bread is not his friend, it gives him all sorts of grief that I won’t go into here but his system can’t cope with it anymore so his lunches for work have been a bit challenging recently. 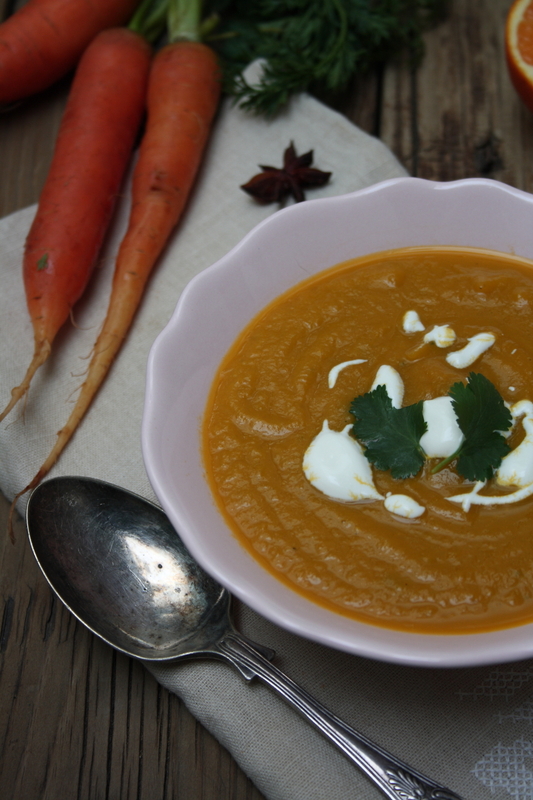 We had a big bunch of carrots in the fridge and I had never made a carrot soup before so I began to think about flavour combinations. Carrot & coriander was too obvious although I couldn’t resist a little on the top for garnish. Ginger has a wide range of health benefits including proven anti inflammatory effects that help alleviate the symptoms of gastrointestinal distress or indigestion. This is one of The Washer Up’s main complaints after eating bread (or anything at the moment) so ginger was definitely going into this soup. Not that I can’t bear to listen to the winging anymore you understand. I am just not that patient. Did I really say “Just eat this and shut up!”? Sweat the onions, celery, coriander stalks, ginger and star anise in the oil over a medium heat with a pinch of salt for 7-10 minutes until softened but not browned. Add the grated carrots, honey and stock, bring to the boil then lower the heat and simmer, partially covered, for about 20 minutes. Pick out the star anise before blending carefully until smooth. Add a big squeeze of the orange juice and season with salt & black pepper. Taste and adjust salt, honey, orange juice as required. Add more stock if it is too thick for you. To serve: bring back up to heat and serve in warmed bowls topped with some coriander leaves and a swirl of crème fraiche if using. I have some more lunch ideas that don’t involve bread coming up soon. Including some Moroccan Spiced Squash & Feta Empanadas that he is very happy with. This is another one of the recipes from my party mezze workshop. We served this spicy, warming soup in little cups with teaspoons. You don’t really need a big bowl of soup as part of a buffet/mezze but a little cup is just the right amount to get you started. I put little bowls of the dukkah on the table for people to sprinkle on top of their soup and to dip their bread into. Dukkah (or duqqa) is an Egyptian spice mix traditionally made with ground hazelnuts. I added some ground roasted chestnuts to the blend for a seasonally festive touch but if you can’t get chestnuts don’t worry. They sell roasted chestnuts at the side of the road here at this time of year, on little stalls. They roast them in big pots, you can see the smoke rising and smell them before you see them. There are millions of different recipes for Dukkah, every family has their own but this is a pretty basic version using hazelnuts, cumin and coriander seeds, sesame seeds and black pepper. The word “Dukkah” is derived from the Arabic word “to pound”. Not surprisingly, all the ingredients are pounded in a mortar & pestle (or processor) into something between a powder and a crumbly paste. It is served as an accompaniment to meals. You dip your bread in some good olive oil (thankfully we have just taken delivery of this season’s harvest of local olive oil which is like liquid gold) then dip it into the dukkah. The spice mix sticks to the oil, then you taste it and you will be instantly addicted. Sprinkle it over soups, stews salads, hummus, yoghurt, anything really. It’s my new favourite thing. I’m thinking of using it in a dessert for a bit of savoury kick. You could add it into a crumble mix or maybe it would work with this fig & almond fumble. Then you would have a dukkah fig fumble. Try saying that after few sherries. It’s pronounced Doo-kah by the way. Heat 2 Tbsp olive oil in a large pan over a medium heat. Cook the leek/onion with a pinch of salt for 3 or 4 minutes until softened then add the garlic and all the spices stirring to coat and cook for another minute or so. Add the cauliflower florets and the water and stir to coat in the spices. Pour in the veg stock, the cauliflower should be covered by the stock, if not add some water and season well with salt & black pepper. Bring to the boil then lower the heat, partially cover and simmer for about 12 minutes or until the cauliflower is really tender. 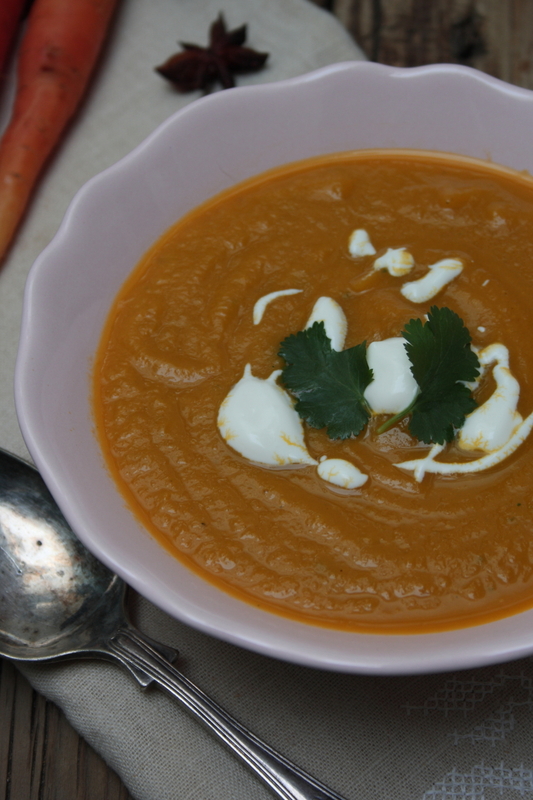 Carefully puree with a stick blender or in a processor, taking care not to splatter hot soup everywhere. When completely smooth add a squeeze of lemon and the fresh coriander and blend again. Pour the soup back into the pan to reheat, taste for seasoning, add more salt or lemon if required. You may need to add a bit more stock or water to thin it down to the required consistency. Serve topped with some fresh coriander and the dukkah. If not already toasted, roast the chestnuts/hazelnuts in the oven for 5-10 minutes, watching carefully, until golden. Remove some of the skins from the hazelnuts by rubbing them, while still warm, in a clean tea towel and set aside to cool. If not already toasted, toast the sesame seeds in a dry pan until golden and pour into medium bowl. Toast the coriander and cumin seeds in a dry pan, shaking occasionally, until fragrant and they start to pop. Pour into a mortar and pestle and grind to a powder. Pour this into the bowl with the sesame seeds. Put the cooled chestnuts/hazelnuts into a food processor and blend/pulse until finely ground. Stir this into the bowl with the spices and add the salt and black pepper. Mix well. Store in an airtight container in a cool, dry place. First of all I am sorry for my lack of posts recently. It’s not that I don’t have anything to share with you it’s that I haven’t had the time. I have been busy writing, testing and perfecting recipes for my cookery workshops. I have one this Saturday which is a Festive Vegetarian Middle Eastern Menu, some of the recipes from which I will share with you soon. We have also just finalised the timetable of workshops for the first three months of 2013. As well as my Vegetarian Mezze Course (the next one being on Sun. 20th Jan 10-2 pm) and my Healthy Baking Workshop savoury and sweet (the next one is on Sun 3rd Feb 10-2pm), I have also introduced two new ones. The first new workshop is the second in the series of Healthy Baking courses; Healthy Baking with Chocolate . The first of which is being held on Sat. 2nd March 5 – 9pm. 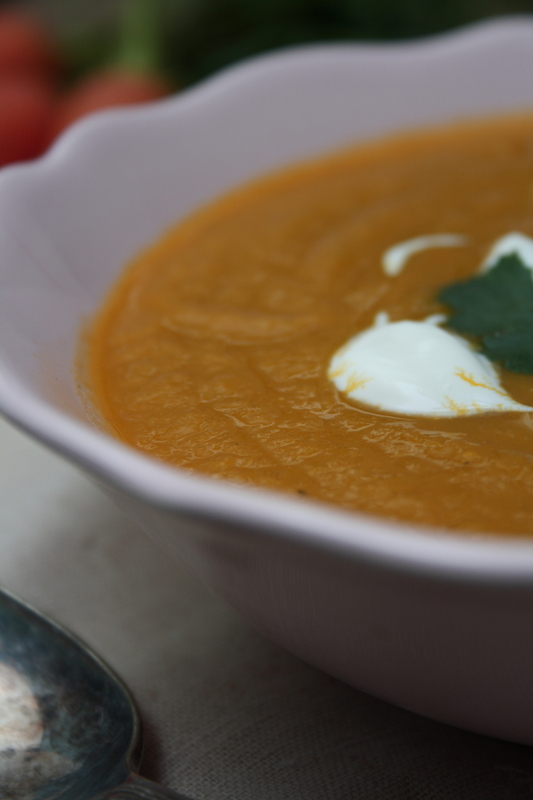 Soups are one of my favourite things to make and eat especially in winter. 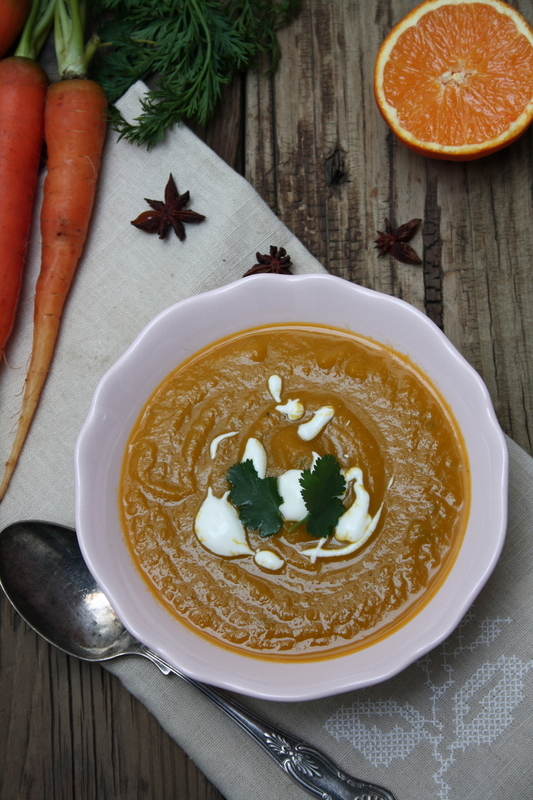 In this workshop you will learn how to make your own veg stock then we embark on a culinary journey through Thailand, Turkey, Italy & France taking some of the most exciting flavour combinations in the world and converting them into delicious soups, some classics and some more unusual. So what do you need to go with all those soups? Bread of course. Some of you who have been following this blog for a while may already know about my irrational fear of yeast. I can’t make it work properly, ever. Whether it is my well-known impatience, hot hands or even the altitude (We live up a mountain and apparently that can affect the “rise”) I don’t know. And I don’t care anymore because I have found the “get out” that is this soda bread. Made with soda (obvs) instead of yeast, you have no waiting, no kneading and no disappointment. It’s just dry ingredients, wet ingredients, mix and bake. Hooray. Mix the flour, flaxmeal, salt and soda in one bowl. In another bowl, whisk the honey, olive oil, lemon juice and milk until well combined. Pour the wet ingredients over the dry and mix it all together with your fingers or a whisk. It should be quite sticky like a scone dough. Bring it together and tip it out onto a floured surface and form into a round or oval loaf shape. Transfer to the lined baking sheet, cut a small cross in the top of the bread with a sharp knife, brush with a little extra milk and scatter over your seeds. Bake for about 25 minutes then lower the heat to 160C and bake for another 10-15 minutes until browned and cooked. Cool for at least 10 minutes. It slices better if it is completely cool. This is a lovely, soft and quite crumbly nutty bread that is also gorgeous toasted. If you want to try a fruitier version which is brilliant for breakfast try my Flax Seed Raisin & Date Breakfast Loaf too. Apples, vanilla and cinnamon, enough said really. Heavenly combination whether in a tart or a scented candle. And if you bake the tart you can save the candle for when guests come round because this fills the house with its sweet perfume. Or make the tart when guests come round and selfishly save the candle for when you are cosied up on the sofa with a glass of (mulled) wine, perhaps. Either way it’s a winner and cheaper than a scented candle. I have perfected my sweet spelt flour olive oil pastry recipe using honey instead of sugar so not only is it delicious and beautiful it is also good for you. This recipe has no sugar, no butter, no dairy and no eggs. The base is spread with a layer of Kellie’s vanilla apple sauce that I also used in this recipe before overlapping the thinly sliced apples in concentric circles and folding up the edges of the pastry. Makes 1 large galette, Vegan. Put all ingredients in small pan, bring to boil, lower the heat and simmer for 15 mins until soft. Puree, taste adjust honey and vanilla to your liking. Leave to cool. Mix the flour and salt in a large bowl then slowly drizzle in the oil and honey, mixing & mashing it into the flour with a fork until evenly combined and crumbly. Slowly pour in the water a bit at a time mixing it with the fork until it comes together (you may not need all the water) then bring it together with your hand, kneading just a little until it forms a cohesive ball. Do not overwork it or it will be tough. You can refrigerate it at this time if you have time. Roll the pastry out on a lightly floured surface, turning it quarter turns as you go to stop it sticking, to the correct size about 2-3 mm thick. Flour the edges of your largest dinner plate and turn it onto the pastry then cut around it so you have large circle. Carefully remove the circle (roll it onto a floured rolling-pin) and transfer it to the lined baking tray. Put it in the fridge while you prepare the apples. You can make mini ones with any leftover pastry using a saucer or side plate. Preheat the oven to 190C. Leaving a border around the edge of about 1 – 1 1/2 inches clear, spread about 4 tbsp of the apple sauce evenly over the base of the pastry circle. Overlap the apple slices in a circle all around the outside edge just inside the border. Then make another overlapping circle of apples going the other direction just inside the first one. Finish off with a mini circle going the same direction as the first in the middle of the circle. Carefully roll up the edges of the pastry towards the fruit turning the tart or paper as you go until it is all done. Brush the edges of the pastry with a little olive oil and drizzle and brush the apples with a little honey/agave syrup. Bake for 20-25 minutes until the pastry is golden brown and the fruit is cooked. Leave to cool for 10 minutes then melt a few tablespoons of honey in a small saucepan with a tablespoon of water until it forms a smooth syrup. Paint this all over the fruit to create a shiny glaze and serve the galette warm. This is one of the recipes from my Healthy Baking Workshop held a few weeks ago. My next workshop is on Saturday 15th December from 5pm – 9pm at Pepe Kitchen cookery school in Benalmadena, Malaga. I will be cooking and sharing recipes from my Festive Christmas Party Menu with Middle Eastern flavour, the perfect antidote to all that turkey. Great for a crowd, buffet or more intimate dinner party. Here is what we will be cooking…. For more information and to reserve your place contact Pepe Kitchen directly. 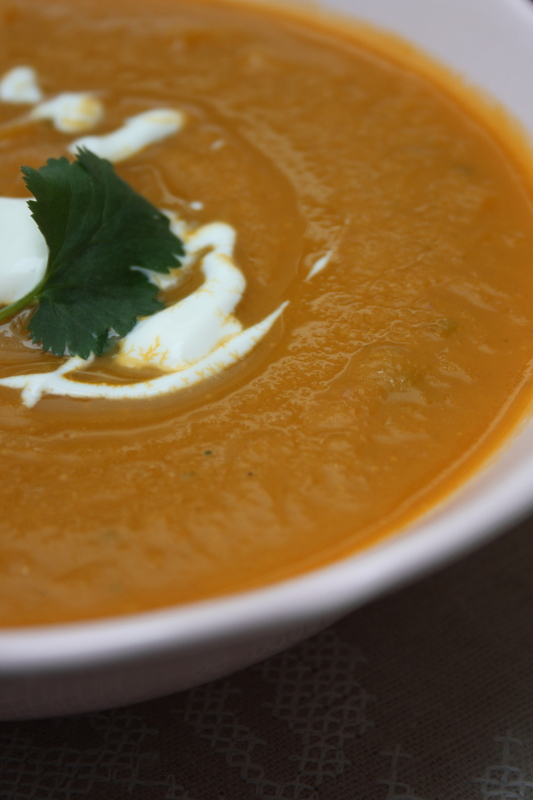 It has turned really cold here now so soup is what I want for lunch every day and this is one of our favourites. I have actually managed to get the “caramelising onions” time down from the usual 90 minutes in most recipes to a much more realistic 30 minutes. I am always too hungry to wait that long and this way works perfectly for me. Peeling and chopping onions is not the nicest of jobs but I have found that cutting off the root end of an onion and putting it on your head like a little hat stops you from crying so much. It looks really stupid and the top of your head smells of onion but much less mascara wastage I find. This tip was given to me by The Washer Up’s nephew Callum and it actually works. I think he spent a day of child slave labour in a Spanish kitchen peeling onions and that is what he learnt. I should really call this Spanish Onion Soup as the only thing that is French about it is the Gruyère cheese on the crouton. That can easily be replaced by a nice mature Manchego which is what we normally do to be honest. The onions are local, organic, Spanish onions, the olive oil is local too and the sherry I use to deglaze the pan is as Spanish as you can get. Heat the olive oil over a medium heat in a large pot. Add the onions, salt, sugar & bay leaves, stir to coat the onions in the oil, cover with a lid and cook for 10 minutes until softened. Remove the lid and cook for 30 minutes, stirring every few minutes, scraping the bottom to remove the brown bits until the onions are a deep dark golden brown colour. Then add the flour, sherry and thyme. Scrape the bottom of the pan again to remove all the caramelised sweet bits and cook the sherry for a few minutes. Add the stock and water, season with salt & pepper, bring to the boil then lower the heat and simmer, uncovered for 20 minutes. Add the Worcestershire sauce, taste and adjust the seasoning. Does it need more salt, more sugar or even more Worcestershire sauce? Brush the baguette slices with olive oil, season with a little salt & pepper and toast under a hot grill until lightly browned. Top with a generous handful of grated cheese, a little thyme and put back under the grill to melt and brown slightly. If you have ovenproof soup dishes you could put the croutons topped with grated cheese directly in the soup, add another handful of cheese and put the whole lot back under the grill. Serve the soup in warmed bowls with the melted cheesey croutons on top.